ARLINGTON, Mass. - It was a battle between two of the top public school programs in the state, and it did not disappoint. 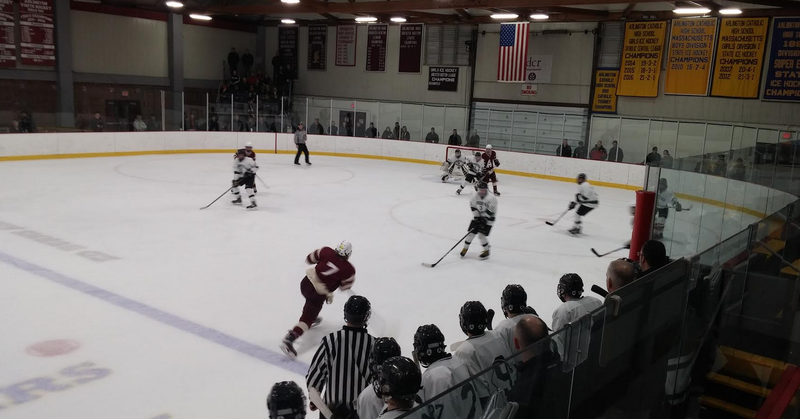 Arlington and Marshfield went up and down for the full 45 minutes, but it was the host Spy Ponders that came out with a 3-2 win and the Ed Burns Tournament title. With the game tied at two coming out of the second intermission, it was Arlington’s veteran core that provided the needed edge against the Rams. The Ponders took a three-on-two across the Marshfield blue line, then completed a tic-tac-toe play from Kevin Ouellette to Mic Curran to Sean Tomaszewski, who slid it home from the edge of the crease for the eventual game-winner. A scoreless first period gave way to a breathless second frame that saw a total of 12 minutes in penalties called and four goals scored. The flow was not good, but the power plays were on point for both squads. The teams traded goals on the power play throughout the period. Arlington’s Peter Scheschareg broke through first with a goal off a rebound 57 seconds into the period before Marshfield answered four minutes later, when Justin Smith poked home a rebound of his own. Mic Curran scored for Arlington before Smith scored his second, on a nifty wraparound, to send the game into the second intermission tied. Curran’s goal came during an extended five-on-three advantage for the Ponders when Marshfield had three defensemen in the box at once. Arlington’s defense stymied Marshfield all game when it was even strength. The Ponders held Marshfield to 13 shots and just two in the third period. Despite not surrendering many shots, Jack Pinard put in some serious work to keep the Rams at bay. Both teams were on the most recent Super 8 watch list and will sweat it out the rest of the week until selections are made for the tournament bracket on Saturday. The consolation game of the tournament was not without stakes as Andover and Weymouth tore the house down in Arlington. The Wildcats needed at least a tie to qualify for the state tournament and did one better by defeating the Golden Warriors 3-2. Clancy led the charge on the offensive end for Weymouth with a goal and two assists. The Wildcats were the more efficient team on offense and used a strong defensive effort to gum up the middle of the ice so Andover couldn’t get into rhythm. Weymouth scored on a pair of power play goals in the first period, the first from Clancy followed by a score from Rocco DiFazio, and never looked back. Andover scored early in the second period, but the Wildcats answered back in the final minute of the frame to maintain the two-goal advantage. Weymouth was anchored by a spectacular 38-save performance by senior goaltender David Erwin. For Andover the loss leaves its Super 8 dreams teetering in the wind. The Golden Warriors were one of the teams on the most recent watch list, but coach Chris Kuchar didn’t seem optimistic about his squad’s potential to make the field.